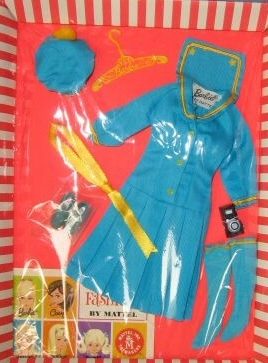 This is Barbie's Sailor dress done in aqua or turquoise blue. It is a 2 piece outfit with a top and a skirt. 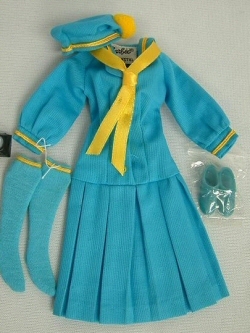 The long sleeve blouse has yellow soutache trim and a yellow satin ribbon tie. The knee length pleated skirt has a dropped waist. Barbie wore knee high matching socks with yellow trim - which seems really odd today, but was perfectly acceptable back then! She also had a matching tam style hat with a yellow pom pon. Although I don't think this is a particularly popular ensemble with collectors, it can still be harder to find. It was only made for one year, and there don't seem to be that many available. Maybe it wasn't that popular in 1969 either.